Location: Thailand is located in the middle of the Indochinese peninsula. Thailand is bordered to the north and west by Myanmar (Burma) and the Andaman Sea, to the south by Malaysia and the Gulf of Thailand, and to the east by Laos and Cambodia. 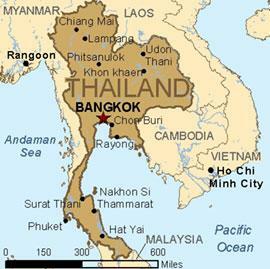 Thailand is partially separated from Laos and Cambodia by the Mekong river. See more Click for map of Thailand. Geography: Thailand is divided into 7 regions: The North, Northeast, Central Plains, East, West, and the Bangkok Metropolitan Region. Each of which has its own distinctive geographical character. Weather: Thailand's monsoons arrive around July and last into November (the 'rainy season'). This is followed by a dry, cool period from November to mid-February, followed by much higher relative temperatures from March to June. Weights and Measures: Thailand uses the Metric system, speed limits are stated in kilometers per hour and you drive on the let side of the road.